Beginners Surfboards for Dummies will guide you through the maze of kelp and seaweed to find the right surfboard for you. Its a beginner surfboards buyers guide. So, what are Softboards? As a general rule, all are a “soft” outer skin not hard fiberglass. Without a fiberglass epoxy shell, the outer soft material is less likely to harm a rider if it impacts them. But, the hard outer shell of fiberglass boards also provide linear strength which helps prevent board breakage from powerful ocean forces. Note: ANY board can break or snap if its engineered strength is exceeded. Softboards require internal structure to strengthen them against breakage (Stringers). These supports are similar to support struts in the wings of aircraft. They are usually made of wood a few have fiberglass but some softies have none. Don’t buy a Softboard without any stringers. Only Liquid Shredder offers a Patented, Dual Aluminum Stringer System with Carbon fiber reinforcement. A good comparison is an old wood and fabric bi-plane compared to a modern aluminum and carbon fiber composite Jet Airplane. There is no comparison in the strength, Liquid Shredder Patented Peruvian boards are strong. Beginners Surfboards for Dummies will explain some differences. So, what are the types of Softboards? Traditional “Foamy” SoftBoards: The foamie surfboards are the oldest materials and technology. Generally, they are lowest cost and made in China. Foamy Softboards vary quite a bit in quality, performance and strength of materials. The lowest price have zero or weak single wood stringers. A few Foamy boards have multiple good quality wood stringers. Even fewer have a combination of wood and fiberglass stringers. The Foam Special Edition by Liquid Shredder offers dual wooden stringers in boards less than 8ft and dual wood plus a third fiberglass in 8ft and longer Soft Surfboards. Soft Foamys begin with an inner foam board shape (blank). This creates the general length, width and thickness (shape) of the surfboard and is usually Expanded Polystyrene (EPS). You know it as “throw away” cooler white bead foam. The outer Top deck skin of Foamys is Expanded Polyethylene (EP) its an air expanded soft foam which is laminated (glued or heat welded) to the top of the blank. The bottoms are usually a slick harder plastic to help made the Foamy Softboard a little faster and more durable. It can be Polypropylene or High Density Polyethylene. It will also be laminated to the basic board shape or blank. The Problems With Lamination: are heat and air expansion. The EPS shape core has lots of air inside. The outer top and bottom skins make an water resistant and and air tight wrapper around the core blank. Once you heat it up the air expands and puts high pressure on this outside skin. This can rip the skin loose and cause large blisters in the deck and bottom. It can be so bad as to destroy the Softboard. Heat lamination is the strongest bond. Glues are the weakest, so insist on a heat laminated Foamy like the Liquid Shredder FSE Series. Traditional foamie surfboard brands also include: Wavestorm, Doyle, Catch Surf and California Board Company. Patented Peruvian Hybrid Soft Surfboards: Liquid Shredder Peruvian Hybrid Soft Surfboards provide a handmade manufacturing technique that is unique in the world of water sports. The LS Patented DAS (Double Aluminum Stringer) and Thermoformed Vinyl (ADV) make Liquid Shredder Hybrid Softboards strong, light weight and durable.Liquid Shredder Peruvian Hybrid are Premier quality surfboards, and have been tested all over the world. This proprietary LS system has passed the test and has proven performance in the best waves in the world; such as Peru, Hawaii, Australia, South Africa, Indonesia and other world-class surf breaks. To achieve this quality Liquid Shredder is constantly testing and refining each of it innovations with super strong and high quality raw material. We are always ready to incorporate within our designs the changes required by the demanding evolution of the sport and lifestyle of surfing. Liquid Shredder Dual Carbon Aluminum Stringer: The Greek “I” is the highest strength linear strength form that exists in the world, we have patented this idea and have constructed it with super strong and light weight materials. A dual “T” of aluminum beams come together to form an “I”. This is the most solid framework ever used in the history of the construction of surfboards. The two “T” are bonded to create the “I” with sheets of fiberglass and carbon making an “I-Beam” stronger than any used in surfboards or SUP Paddleboards today. LS Pressure Relief Valve (PRV): Allows the Liquid Shredder boards to “breathe” according to varying temperature conditions. In the cool, like at night to absorb air and in the heat by day to expel pressure, the PRV. Allows breathing in cold and heat avoiding delamination, Keep the area of ​​the valve free of wax. LS Foam Blank X-EPS: Expanded polystyrene (EPS) is a foamed plastic material, derived from polystyrene, this raw material is light, ecologically friendly and sealed cell. This sealed cell process, called “Extruded EPS” means it does not absorb water. X-EPS being flexible makes the board have greater cushioning giving it in medium and large waves greater control than other materials. 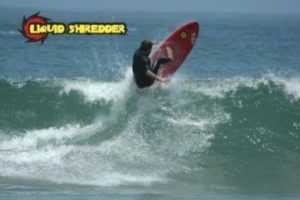 Liquid Shredder uses X-EPS foam in all types of wave riding vehicles, be it Surfboards, Paddleboards, SUPs or Bodyboards. It is ideal for any type of waves and in different conditions. Liquid Shredder leads the pack in the development of high technology materials and technology. There are many websites which provide beginner surfboard reviews and soft surfboard reviews. Beginners Surfboards for Dummies asks you to Share Comments. Click a Comment Below Left to Open the Comment box. Tags : beginner surfboards | foamie surfboards | kids surfboards | liquid shredder | soft surfboards | soft top surfboards .